My dearest readers, have any of you ever tried making your own sushi? It is seriously fun and surprisingly easy (once you get the hang of it). My mom, husband and I prepped by watching this DIY sushi video from Epicurious, and we decided to make our very own version of a spicy crab roll and a Philly roll. Hope this inspires some of you to get creative in the kitchen, and try this for yourselves at home. It would be such a fun thing to do for a date night or DIY dinner party! 1. Note: Amounts of rice, water, and vinegar will vary depending on how much you are making. When I woke up that morning, I made the sushi rice according to the instructions on the package. You put the rice in a glass bowl, and basically rinse it like 7439508405943 times. The goal is to have the water run clear when you swish it around in the bowl. Once that is finished (or you loose patience like I did and decide it was 'good enough'), pour the rice and cold water into a pot. Cover, and bring to a boil then let simmer. Cook for 20 minutes or until the water is absorbed. Remove from the burner and let it chill for 10 minutes. After that 10 minutes is over, mix in some rice wine vinegar. Let that cool off in the fridge, since warm rice makes the nori kind of soggy and super easy to tear. Trust me. 2. Start prepping the ingredients. Peel and thinly slice the veggies. Shred the crab meat and mix in the spicy sauce (a mixture of mayo and sriracha...just keep taste testing until it's spicy enough for you). Slice the cream cheese into skinny 1/8" strips. Get two bowls of cold water (I'll tell you why in the next step). In this step, do whatever it is you need to do to make the assembly of the rolls as easy as possible! 3. After that, you are pretty much ready to rock n' roll your sushi! I saw a video tutorial where someone put their bamboo mat in a big plastic Ziploc bag, which is brilliant because it keeps your mat clean. We started with a 1/2 sheet of nori like the Epicurious video suggests, but the rolls were so overstuffed that they wouldn't close (hence the reject pile!). So, after that, we decided to make things easier and worked with a whole sheet of nori after that. 4. Dips your hands in the cold water so you don't become a sticky rice magnet. 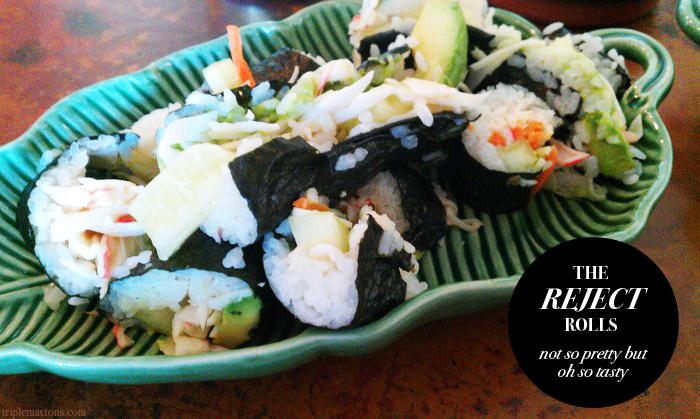 Grab about a handful of rice, and spread it out on the nori, leaving about a 1/2" of free space to seal the roll up. Sprinkle on sesame seeds. Mom got a little fancy with one of her rolls and did it "inside out" style...you can find a vid tutorial here. Now's the time to put your fillings in. Here's what we used for the Philly rolls: nori, rice, sprinkle of sesame seeds, rolled up salmon, cream cheese, cucumber, and avocado. Here's what we used for the spicy crab rolls: nori, rice, sprinkle of sesame seeds, spicy crab mixture, carrots, cucumber, and avocado. 5. Roll it up! Seal the free edge with some water. Dip your knife in some water so it glides through the roll easily, and cut it in half. Then take the two halves, put them side by side, and cut into thirds. 6. Place your rolls on a plate with some soy sauce, ginger and wasabi. 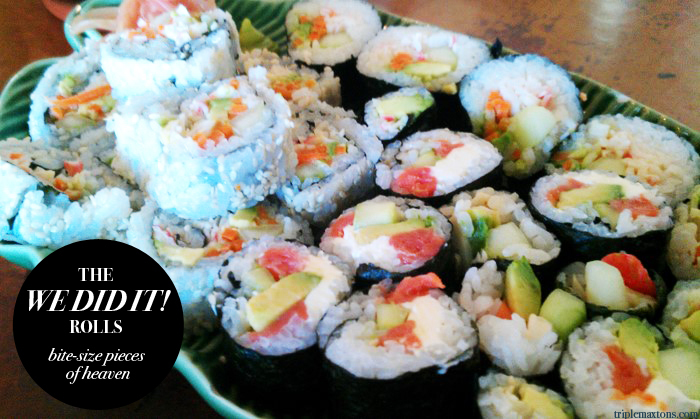 Proceed to stuff yourself silly on your very delicious and homemade sushi! I want to learn how to make these!!! You know when you're rinsing the rice? you "swish it around" and you empty the water out.. and do it all over again. I used to do it this way when I was a little girl. My Dad taught me a trick and instead of spending close to an hour getting the water to run clear, he did it in less than 10 minutes. What you do is after you're done swishing it around the first time and after the water has been drained, you sort of do the same swishing motion without the water. Then you add water and rinse/swish again. When emptying the water, it helps to let the water from the faucet run through the rice as you pour. I hope THAT made sense. It made sense in my head as I wrote it and I refuse to read it again in case it doens't. THANK YOU, Tiffany!!! Seriously, your advice is priceless...I am so happy you shared that tip with all of us. It will be a HUGE help the next time we make sushi! you are amazing! I have been afraid to try making sushi. I love that you added the rejected picture too! Hi Caitlin! 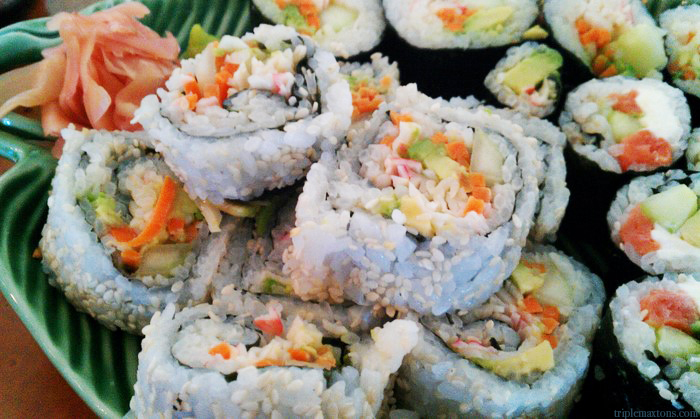 I couldn't resist posting our trainwreck rolls....gotta keep it real, ya know!? You should def try to make some sushi - it's so fun, and you can make your own "preggo approved" version up. :) Or as my husband suggested tonight, you could go the bacon sushi route. Haha! Awesome!!! I so love eating sushis :) great job girl! Hi, that serving dish that you're using seems very familiar to me. I have one just like that!!! It's designed by a very famous (dead) portuguese artist called Bordalo Pinheiro.